Biologist Maureen Donnelly says the climate crisis is the greatest challenge of our time, but she has hope for the future. (From left to right) Brian Schriner, Patxi Pastor, Mike Heithaus and Evelyn Gaiser of FIU met with former U.S. Vice-President Al Gore (center) to discuss fow FIU is helping people understand, adapt and persevere in the face of sea level rise through the FIU Sea Level Solutions Center. 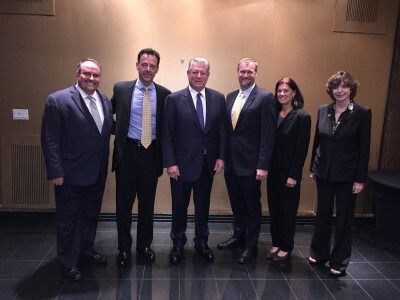 She was one of 1,200 climate change leaders, including FIU faculty, staff and students, representing more than 80 countries throughout the world who recently attended the Climate Reality Leadership Corps training with former U.S. Vice President Al Gore. The workshop, hosted by FIU and The Climate Reality Project, offered training in climate science, communications and grassroots organizing to tell the story of climate change and how to inspire communities to take action. 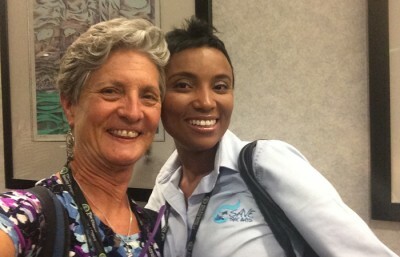 FIU biology professor Maureen Donnelly poses with former student Vanessa Haley at the Climate Reality Leadership Corps Training. The climate reality activists had the opportunity to hear from Gore, who is the founder and chairman of The Climate Reality Project, as well as scientists, strategists, communicators and technical specialists about climate change science and the direct cost climate impacts are having on communities around the world. Tiffany Troxler, director of the Sea Level Solutions Center, was one of the speakers at the training program. The ecologist gave insight on global greenhouse gases, as well as alternative sources of energy and solutions to sea level rise. The Climate Reality Project trainees also learned skills in public speaking, social media networking and media engagement. The hope is these world-changers will be able to shape the conversation on climate in forums from family dinners to international summits and building a 21st-century movement for solutions. 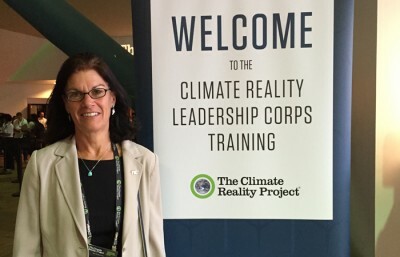 Rita Teutonico of the FIU School of Environment, Arts and Society participated in the Climate Reality Leadership Corps Training to mobilize citizens to take action on the climate crisis. According to Rita Teutonico, executive associate director of the School of Environment, Arts and Society, FIU was selected as the co-host for the training because of its expertise in the natural, physical and social sciences — along with architecture, engineering, computer sciences, law, communications, business, health and tourism management. FIU’s Miami location was also key in the partnership. South Florida is particularly vulnerable to climate change because of the large number of assets exposed to the effects of sea level rise and other impacts. For Donnelly, she is now part of a movement of global citizens taking action on the climate crisis. She hopes to use her training to inform citizens on climate change and communicate what resources are available for them to take action. She, alongside Teutonico and the other activists, hope to engage the community in associated climate activism events taking place on campus and in the community, including 24 Hours of Climate Reality Nov. 13.